If it’s winter in the Bay Area, you know we’re all talking about Dungeness crab: who’s fishing it, who’s cooking it, and who makes the best. The fishing season for this sweet crab is typically open from November through June which means local restaurants can often offer whole roast crabs through the winter and sometimes into spring. If this makes you as excited for winter as we are, keep reading to find out where you can eat whole crab from Half Moon Bay through San Francisco and up into Sausalito. This small, locally owned seafood restaurant and fish market in the Castro has been operated by the same owner since 1977. Their menu includes only fresh and sustainably caught fish, shellfish, crab and simply prepared seafood dishes. 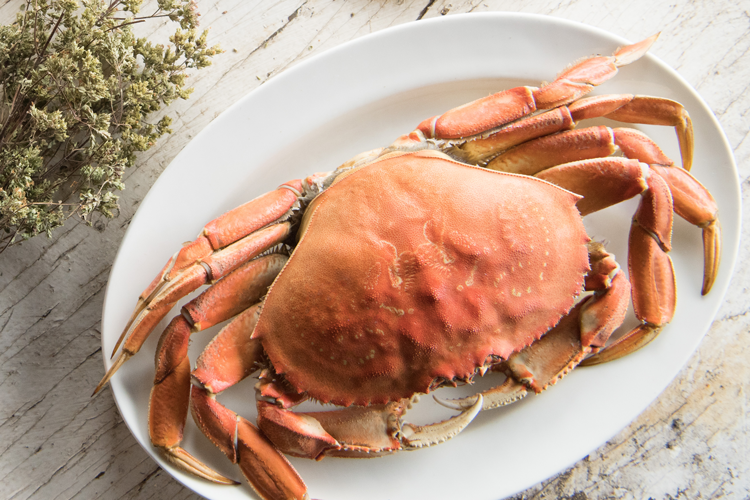 During Dungeness crab season, you’ll often find cracked crab on the menu alongside crab cakes and some of the best oysters on the West Coast. Bar Crudo is a raw bar famous for their pristine oysters and raw fish presented in creative and unique preparations. While supporting local producers and sustainable practices, they’re offering some the simplest, freshest and best seafood in the Bay which includes Dungeness crab by the half or whole. Located inside the grounds of Golden Gate Park and overlooking Ocean Beach, Beach Chalet is a favorite brewery and restaurant experience in the city for both locals and visitors. The food menu features everything from a Brewers Grain Vegi Burger made with spent grain to Grilled Pacific Swordfish and everything in between. While the crab is in season, Beach Chalet is offering an entire Dungeness Crab menu which features whole, two-pound crabs alongside creative preparations like a Dungeness crab tostada. Blue Mermaid Restaurant at Fisherman’s Wharf is connected to the Argonaut hotel so the fresh seafood fare is paired perfectly with oceanfront views as well as decor inspired by the sea and our city’s aquatic history. In addition to crab dishes like Baked Crab Dip, Crab & Corn Chowder and Dungeness Crab Cakes, they offer a Dungeness Crab Boil served with delicious flavors like chorizo, corn on the cob and red potatoes. Crab House is one of the landmark restaurants on Pier 39 thanks in large part to their crab menu which features the Killer Crab, a whole crab roasted in a secret garlic sauce and other addictive eats like sizzling crab legs, crab chowder, crab Caesar, crab enchilada and crab cakes. Their fresh Dungeness crabs always weigh at least two or more pounds and are harvested from the Pacific Ocean. Crustacean is one of several House of An restaurants around the state. Master Chef Helene An’s culinary legacy includes her use of the secret kitchen, a completely concealed kitchen within the main kitchen that is off limits to all employees except the An family and the chefs that have a part in An’s famous dishes. The famous dishes that come out of this secret kitchen include Whole Roasted Dungeness Crab and Chef Helene’s famous garlic noodles. Fish is one of Sausalito’s most famous restaurants and is often mentioned on roundups of the Bay Area’s best seafood. Open seven days a week and located right on the water, the restaurant is home to the region’s freshest and most sustainable seafood because they care about what you eat and how that affects our environment. Because of this, they offer some of the best Dungeness crab in the Bay Area when it’s available and they prepare in ways that will have you coming back for it year after year. Created by the family who developed PIER 39, the history of Fog Harbor Fish House spans over three decades and three generations. Still family-owned and operated today, the restaurant was also the first restaurant in Fisherman’s Wharf to serve 100% sustainable seafood. 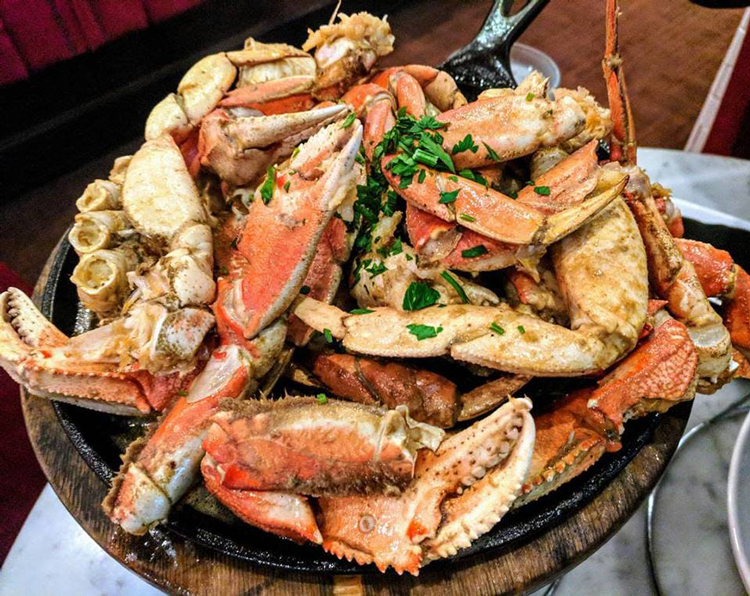 The main menu is a gargantuan display of seafood selections and it includes Dungeness Crab Cakes, Dungeness Crab Louie, Whole Dungeness Crab and their famous Garlic Roasted Whole Dungeness Crab. Foreign Cinema has been a San Francisco staple since 1999. They have an extensive list of awards and accolades, including more than 15 consecutive years on the San Francisco Chronicle’s Top 100 Restaurants. 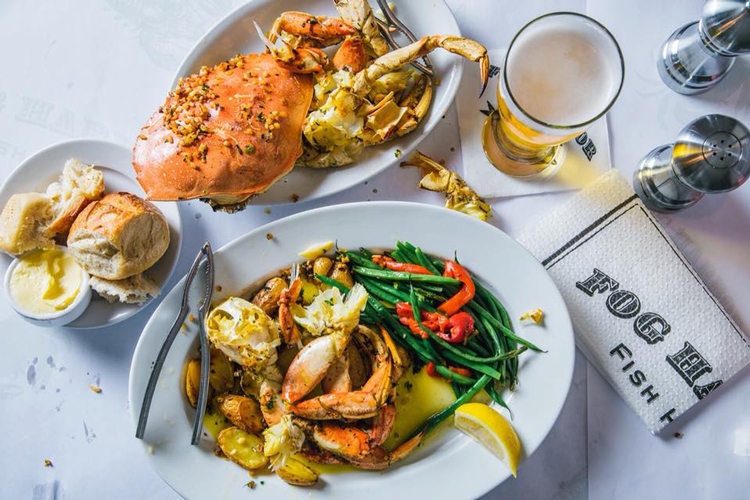 While you’re basking in the ambiance and enjoying classic films on the outdoor patio, you can dine on a regularly rotating menu of some of the best foods in the city, including local Dungeness crab available by the half or whole. Fisherman’s Wharf is famous on its own for world-famous seafood, but The Franciscan Crab Restaurant offers some of the best. With high ceilings and twenty-foot windows, you can dine alongside views of the San Francisco Bay, the Golden Gate Bridge, the Bay Bridge, the San Francisco skyline, Alcatraz and historic Fisherman’s Wharf. Their daily menu often offers Sizzling Dungeness Crab Legs, Dungeness Crab Cakes, Dungeness Crab Cocktail and their famous Whole Roasted Dungeness Crab in secret garlic sauce. When the Half Moon Bay Brewing team started brewing operations in 2003, they opened the first operating brewery on the San Mateo Coast since 1873. Today, they’re one of the region’s most talked about breweries and their Half Moon Bay headquarters has grown into an award-winning brewery and restaurant. 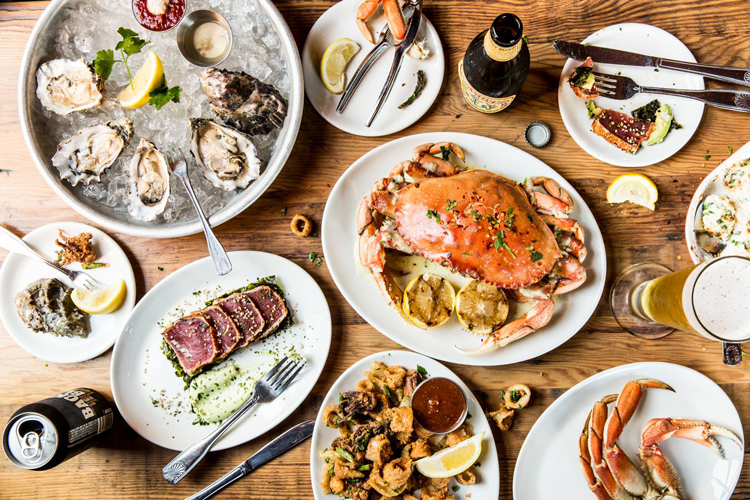 Their food menu includes highly sought after items like the Impossible Burger, a Dungeness Crab Roll, fresh caught fish available daily, and whole Dungeness crab available seasonally and in several preparations. 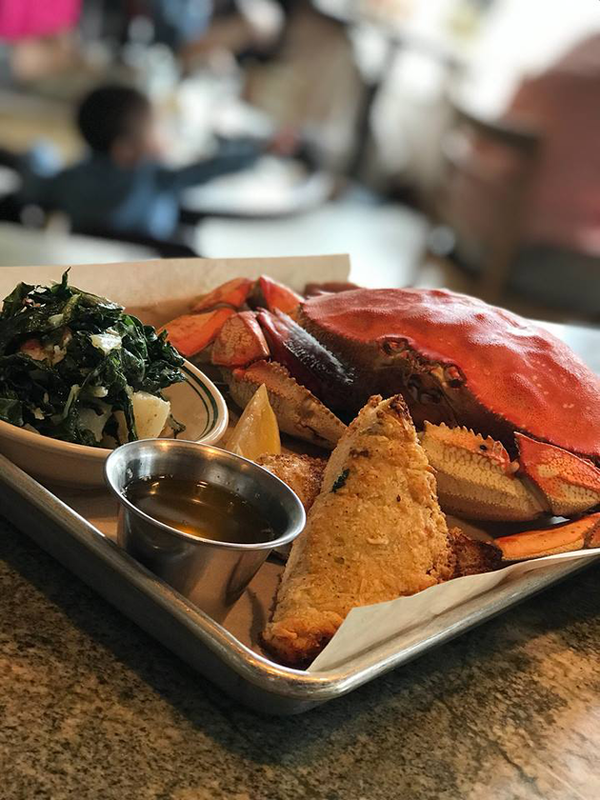 PPQ Dungeness Island is known for serving the highest quality and freshest crab in the Bay Area which is why they’ve landed on nearly every Dungeness crab roundup there is. Inside the cozy, island-themed restaurant you can get famous preparations like the whole roasted crab in garlic sauce and the mouth-watering peppercorn crab. Since 1965, Scoma’s has been serving seafood with the same local and fresh philosophy. Everything is caught in the Pacific on small boats and brought to the pier by local fishermen so you can taste the freshest fare right on the water. During Dungeness crab season, you can often find this sweet, garlicky crab on the menu alongside their famous clam chowder. In 1971, Thanh Long opened and was the first restaurant in what is now the House of An family of restaurants. At its opening, it was hailed as San Francisco’s first Vietnamese restaurant and has continued to impress for decades. Straight out of Master Chef Helene An’s secret kitchen, you can enjoy whole Dungeness crab roasted with An’s garlic sauce and secret spices. Pair it with An’s Famous Garlic Noodles for the perfect meal. This Embarcadero mainstay has been named one of the Bay Area’s best seafood restaurants, one of the most romantic restaurants in San Francisco and the dining room offers one of the best views in the city. The daily changing menu represents the day’s best fresh-caught and sustainably sourced fish alongside one of the most expansive selections of West Coast oysters. Their impressive lineup of iced shellfish includes a crab cocktail, one and a half pounds of Maine lobster and, of course, whole Dungeness crab. Photo courtesy of Woodhouse Fish Co.
Woodhouse Fish Co. has two San Francisco locations in Lower Pacific Heights and Mission Dolores. Both locations are open every day except for Thanksgiving and Christmas, wake walk-ins only, and serve some of the best New England-inspired seafood dishes in the city. Expect to wait when you come for lunch or dinner, but you can also expect to eat some outstanding lobster and crab rolls as well as whole Dungeness crab while they’re in season.